It doesn’t feel like Christmas around here until the pink tree is up. I still wish our tree was a little taller. We have the 6′ tall version, but it’s a bit dwarfed by our 9′ tall living room. I noticed a new, lighter pink tree is available this year! Kind of makes me want to sell this one and get the other in a larger size, but I do love our little pink tree. I am so insanely jealous of that tree. I LOVE it!! Love the tree. It looks pretty much perfect in these photos. I dunno…tough call. I do like the pale pink and it would be awfully pretty filling that vertical space so nicely. 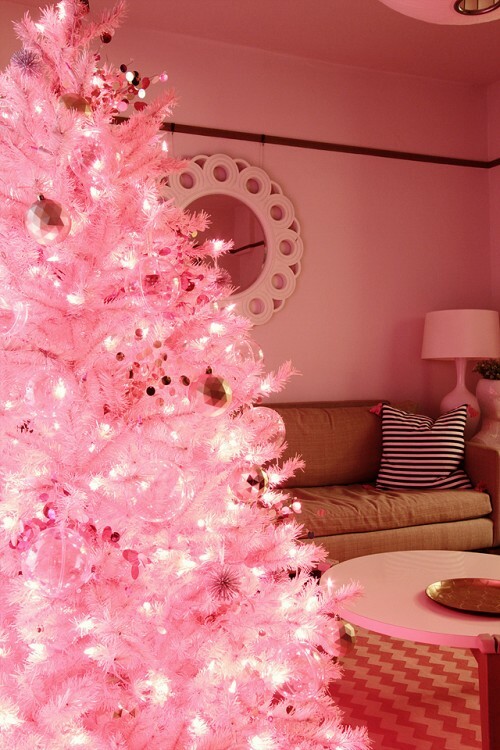 I love pink Christmas trees…sigh…I would like one one year..maybe even a baby pink tree. LUV this ALOT!! I’ve done that with concrete blocks. They were stable, sturdy, elevated the tree and could be hidden under the tree skirt. I love love love your pink tree! I convinced my husband to let me put one up this year (something about it being ‘hipster’ and ‘ironic’ worked…), though it is only 3 feet tall. I didn’t realize your living room was 10′ tall! That tree looks great. The room seems so cozy. Whoops, I edited the post. I don’t know what I was thinking; Our living room is only 9′ tall! Ooh, I see you’ve switched out the art over the sofa! Are you going to put something on that poor naked wall by the window? I upgraded from a little white tree to a BIG white tree this year (like so), which is 7.5′, and that’s how I discovered my living room is only 8′ tall. My MIL sets her tree up on blocks too and covers with a tree skirt. I didn’t know this until I helped her take it down last year. Tricky. What a perfect pink Christmas! I don’t think my husband would ever let me pull this off in a common area lol. 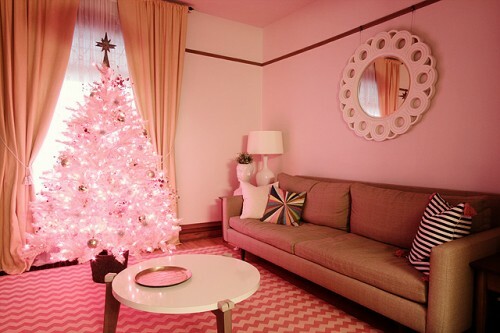 I also love the color of the light in the room with the pink tree! Wait until after Christmas and buy the taller tree on sale, then sell the smaller one at the start of the season next year! Although I think it looks lovely as it is, and I am very envious of your gorgeous tall ceilings! So beautiful! it reminds me of when i was a little girl and begged my mom to buy a jazzier fake Christmas tree! I love your pink tree, Nicole! and can you remind me where you got your living room couch? 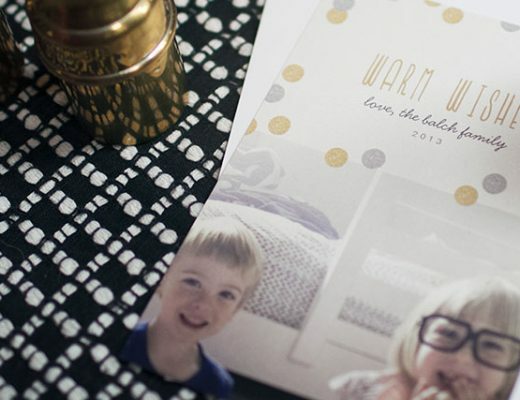 We are in the market for a new one and I love the LENGTH of yours- amazing! I love the Pink tree. 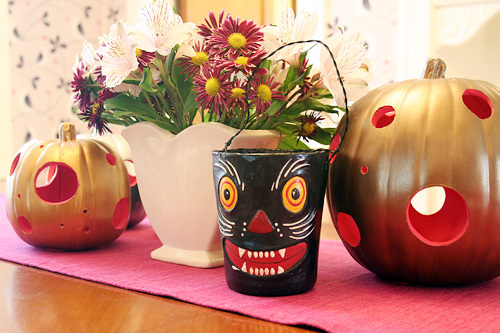 I couldn’t pull it off in my house but it looks absolutely lovely in yours! It’s beautiful, and it has such a lovely soft glow to it. Very subtle. And even though it’s pink, it’s the ‘greener’ way to go. Love it! I loved it last year, and I still am completely enamored by your pink tree! Hi! I absolutely love your blog! I decided to get a pink christmas tree this year and while googling I was brought here! I ‘m not sure if you’re still interested in the cotton candy tree, but I wanted to let you know that the reviews say it’s actually quite bright. Figured I’d let you know!